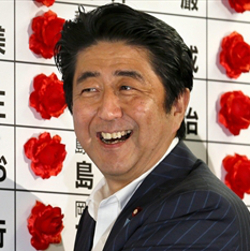 Shinzo Abe, Japan's prime minister since December, has led the Liberal Democratic Party he heads to another win, in the country's upper house, following elections this week. And the guy obviously dyes his hair. Would you vote for a guy who dyed his hair? Apart from this distasteful cosmetic subterfuge, under Abe Japan the economic body has been bulking up, sucking in craploads of cash in order to print money in its own version of QE, adding to a public debt bigger than two times national GDP. Abe is behind the push to stimulate the economy, which has stagnated for 20 years due to the country's restrictive immigration policies and regulations; a low birthrate and rapidly rising quotient of retirees means nothing's replenishing the tax base as the country ages. But Japan's ingrained xenophobic essentialism means it will never open its doors to the thousands of Chinese and Koreans who would otherwise rush in to help support the sagging economy. Instead, Abe - a chest-pounding nationalist who continues to anger China and other victims of Japanese pre-1945 colonial policies - has decided to further burden Japan's yet-to-vote youngsters - those who will have to service the staggering debt in the future - and has thrown caution to the wind. Easier to cripple the economy for a couple of generations than tackle the parochial mums and dads and grandparents who continue to view Japan as a special case, a nation apart. It's all wind; one day its direction will change and it's not hard to predict where the crap will land. More recently it was a haven for graffiti artists and [Stuart] Penklis [Mirvac's national director of apartment and commercial development] said Mirvac was hoping to keep some of this graffiti in the new complex, as well as restoring one of the old trams that had sat derelict in the sheds for years. That "more recently" is more than a little obtuse. The graffiti in the tram sheds is at least 30 years old, and dates from at least as early as my undergraduate days at Sydney University, a time when I lived in Glebe. Back in those days the architectural feature now labelled officially the university's Graffiti Tunnel was just a convenient access way between two points on campus, one that happened to be slathered in graffiti. The university was smart and later decided to make the impromptu work of late-night daubers the defining characteristic of their subterranean alley. As a result of this liberal foresight, university managers have given due weight to the cultural meaning of the tunnel, and have thus enriched their campus - surely one of the most extraordinary collections of architectural styles existing in the southern hemisphere - forever. Mirvac owes it to the history of Glebe to do as much as the company possibly can to retain the graffiti in the Glebe tram sheds. In my day, 30 years ago, Glebe was a haven for poor students - much as Newtown also was - although it's too pricey for most now; you see besuited young professionals today tramping up Glebe Point Road of an evening going from Broadway with their shopping bags to their apartments or rooms further up beyond the old Valhalla Cinema. It is people like these who will be living in the Harold Park apartment complex when it's finished. But people don't live in Glebe to get away from the grungy vibe, it's what makes the place so special, and gives it the social cachet that attracts young people with good incomes to buy and rent there. 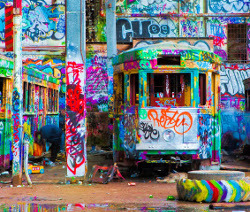 Mirvac has a huge responsibility now as they face the prospect of maintaining the cultural artefacts - the rich layers of graffiti in the tram sheds - that give the structure a unique meaning and a special charm. Let's hope that they choose wisely and do the right thing, just as the university did.